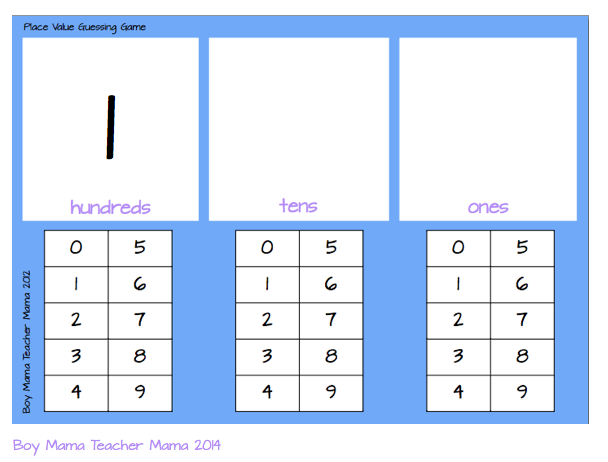 This is a fantastic game to help children with place value. Here’s how…. Print the templates. Cut along the dotted line on the millions page and discard the excess paper. Glue or tape the three templates together so they look like this. Note: these templates are printed in pieces on purpose. When working with younger students/children you will want to begin with only the hundreds, tens and ones portion. As students become more proficient and with older students you can add the other two pages on to add more of a challenge. Laminate or cover with contact paper for multiple uses. Decide how many digits you are going to work with and cover up the extra space so they are not distracting. Hang the game board on the classroom board or lay it on a table in front of a small group. 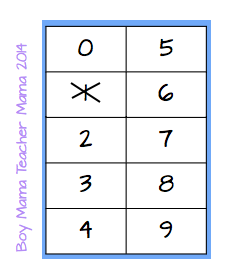 Choose a number and write it on a slip of paper (or just remember it). says “No” and crosses off that number in the small box below the hundreds place. Note: Having this box and keeping track of incorrect guesses, models organization skills and keeps students from guessing what others have already guessed. The game continues in this manner until all the digits have been guessed and the final number is complete and shared. What a fun way to practice place value!